The thing that I notice from teaching upper grades these last six years is that we seem to be taking choice of all kinds out of the curriculum. I imagine it’s because the kind of teaching that’s most measurable is the kind that yields something measurable to assess, which most easily happens when you’re deliberately and specifically teaching something. I’m sure that has brought many benefits, but I also notice that when children have authentic choice (not the kind of managed choice where they’d honestly rather not choose any option they’re offered), they work with vastly more enthusiasm and energy. I also think, but couldn’t prove, that they work more skillfully under these circumstances. The problem I’ve found is that choice can be difficult to manage because it looks and feels – and on occasion is – anarchic. So on the one hand choice feels very powerful because of what it releases in the children. And on the other hand choice feels profoundly challenging to harness and assess. I’d be so curious to know your thoughts! Well, I’ll have to stretch my thinking somewhat to think about fifth graders and choice. First of all, I’m not against ‘direct instruction’ as part of the school day. In fact, it is, in my opinion, important to do at the right time. However, I really do think that children, even in fifth grade, need time to make choices, explore ideas and materials and work cooperatively on self-directed projects. When I was teaching kindergarten at P.S. 321, my class ‘partnered’ with Adele Schroeter’s 4th grade class. The first few years, we worked at being reading buddies. After awhile, though, Adele realized that she was not having enough time to cover all of her curriculum. We decided, instead, to become inquiry buddies. The first year of this experiment, Adele and I met during the summer to think about how this would work. We thought that most of the children probably had some time at the beach and we decided to do a joint study of the seashore. We mapped out all of the possibilities that we could think of for this study, including places we might visit, experts who could be interviewed, books children could read on the subject, possible projects, etc. Our big idea was to concentrate on ecological issues. When we began working with the children, however, they changed the direction of this inquiry. The children, kindergarteners and 4th graders, were much more interested in the animals that lived in the sea and rivers. We eventually worked out a compromise but the big emphasis ended up being on sea life. As part of this study,we took a boat ride in Jamaica Bay, visited the NY Aquarium and also the Marine Biology department at Kingsborough Community College. After a few months, groups of partnerships (k and 4) each picked a sea animal to study together in greater depth and they decided, after weeks of ‘study’, on how they were going to share their new information with the class. Some groups made elaborate posters, another group made a video presentation, another group acted out their presentation. I think that the children gained so much from this experience, over and above learning about sea animals. Among other things, they learned that they could direct their own inquiry about something that really interested them, they learned about research, interviewing techniques, and working cooperatively. They were doing reading, writing, science and math. And…they were having a lot of fun! Adele and I, other years, did a bridge study together, a waterway study and a huge survey of all the birthdays of everyone in P.S. 321. In terms of “anarchy”, it is possible (and actually necessary) to have a structure that helps guide children when they are doing this kind of work. 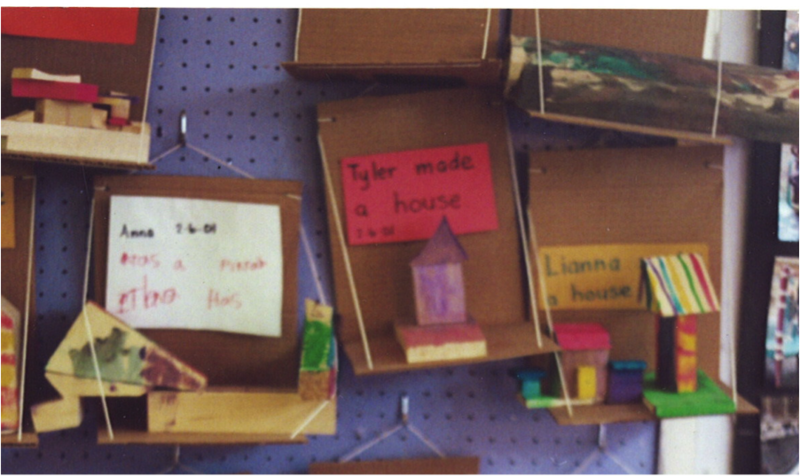 I’ve watched second-graders work on projects where they designed and created buildings out of a variety of materials. They made blueprint plans (lots of work at group decision making! ), tried following their plans using the materials that they chose, made revisions when things weren’t working, wrote descriptions of their project and of the process of creating their buildings. There were ‘rules’ for different aspects of the project. The teacher had expectations but she also left most of the decision making up to the children. They had to do measuring, writing, reading books for construction ideas, etc. The room certainly wasn’t silent. There was a lot of talking and laughing. The teacher(s) – this was a Cooperative Team Teaching room at the Brooklyn New School- conferred with the different groups and, at times, had to remind particular children about some behavioral issues. I was, however, surprised at how infrequently this teacher intervention was needed. I realize that there are a multitude of ‘have-to’s” that are imposed on teachers today. Nevertheless, I also think that it’s crucial that the school day be filled with fun, excitement and interesting challenges that are right for all of the children. If we, the educators, don’t stand up for this, then who will? in reading, writing, math, science, and social studies. And there’s no limit to young children’s vast enthusiasm for learning.